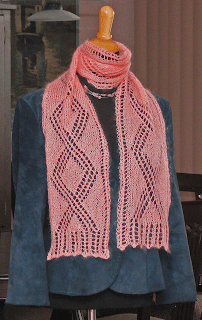 They are simple to knit (only a 2 row stitch pattern) and the yarn is so soft. They are knit with 1 ball SRK On Your Toes Bamboo sock yarn (75% bamboo, 25 % nylon) 100g/ 3½ oz, 300m/ 328 yds, colour # ON260805, Seashell Multi. My husband keeps telling me that if I'm serious about being designer I need to do market research. So I asked my 25 year old friend what she would want to knit (if she could knit). Shareena said leg warmers. Pattern Three was born, I'm pretty sure that this is not what my husband meant by market research. Knitting needles clicking in a quiet room full of Knitters....need I say more? I worked for Bell Canada for a long time. I started as an operator when I was 17 and worked part time through High School and University. After completing a Psychology degree at the University of Toronto I settled down in a full time position and pursued knitting purely as a hobby. I was always passionate about fashion and clothing and that gave me a great deal of enjoyment. At Bell ageism was a fact of life and retirement packages came out regularly. My husband and I carefully assessed the first two that I qualified for and in both cases decided I should keep working. Our financial planner advised me that the only really sure way to take a package and be completely confident that the decision was right was to assess it and make the assumption that you might never work again. If the assessment determined that you would be OK under those conditions then she said go for it! In 2004 another package came out. Rumours were rampant that more people would be eligible than ever before. The rumours were wrong! Eligibility followed the same legally determined rules as always. However the offer was the best Bell ever made and included an unprecedented increase in pensionable earnings. When I did the assessment it made no financial sense to stay... so goodbye Bell Canada. I was 48 at the time and not ready to retire. I did explore a knitting career at the time but couldn't see a way that worked for me. I worked on contract for another year at Bell and then did a stint at Village Yarns http://www.villageyarns.com/ I eventually ended up at a small Bay Street brokerage firm doing reception and basic administration work. I've been wearing hats every day for a long time. I have over 50 without even starting to count the hand knitted ones. 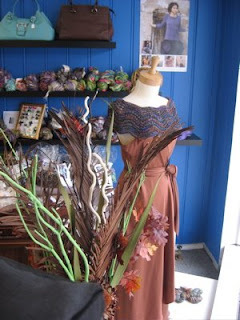 A few years ago I took a millinery class that focused on sewing hats. The instructor brought a suitcase full of her own hats for the students to try on. One of my favourites was a fur trimmed pillbox. I thought to myself. " I can knit that!" Pattern Two is the result. Pattern One - The Hug"
My good friend Beth test knit this pattern for me as well as suppling a name for it. I've knit more than one because it's such a good use for little bits of yarn. Beth has done Hugs with many different yarns while i generally used only one or two. Ravelry http://www.ravelry.com/ is such a fabulous resource. I am so impressed by what they have created. I constantly follow threads that will help me during my transition. I find the forums to be endlessly educational and occasionally I will throw in a question of my own for clarification. My guild uses a group to communicate with members so I check in regularly with them but my very favourite thing about ravelry is the way it connects the community of Knitters world wide. Every question gets an answer and I just love that everyone is so generous sharing online tutorials and other resources. Some Knitters describe Ravelry as Facebook for Knitters but I think that description does not even come close. It's WAY better! I've got lots & lots of knitting friends now. Some of the ones who didn't knit I turned into knitters. Originally I was an isolated Knitter. There was no internet (now you know I'm not that young anymore) and the only people that I knew that knit were related to me. Today I'm a member of a large guild, the DKC http://www.downtownknitcollective.ca/ as well as a small group we call KNIT or Knitting Night in Toronto. We meet once a month for dinner and have done so for many years now. Originally the discussions were all about knitting but over the years the conversations have begun to cover a much larger range of topics. The glue that holds us together is knitting as we vary in many ways but I've forged long term relationships with these women and look forward to seeing them every month. It's just knitting but it brings an amazing treasure trove of other riches into my life. Someday soon I'm going to become a full time hand knitting designer. I'm going to write about this change in my life and hopefully look back to assess what I did right as well as the mistakes I make along the way. I'm publishing on Patternfish.com and currently have 6 patterns up. They are fairly simple as I've taken advice from my informal advisory board (they don't know yet that I think of them that way) and they all suggested that I start small while I grow my skill set. The board is made up of one test knitter, one technical editor, one professional designer, my husband (who is tech support, the head of marketing and the chief photographer) as well as any other knitters who will answer my questions.